Every girl needs a fun, flirty dress in a gorgeous, bold color. Cue this 'Jackie' dress from CeCe by Cynthia Steffe. 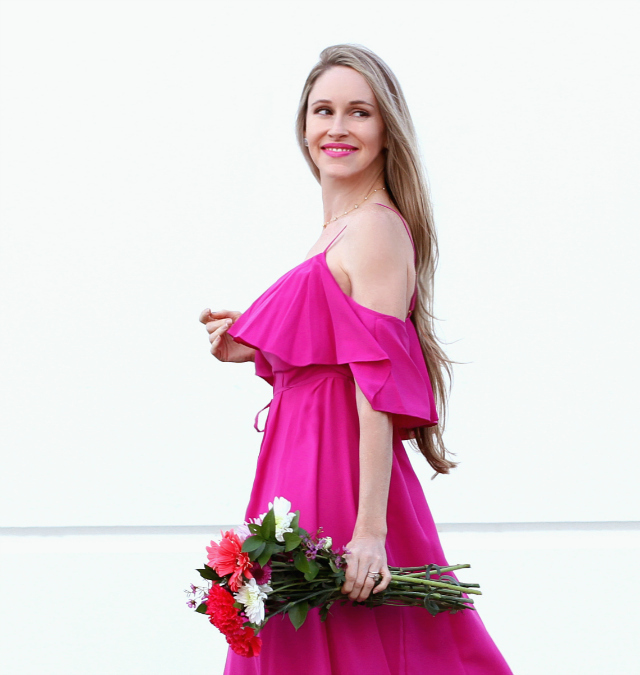 It hits all the right chords: feminine, ruffled, cold-shoulder sleeve detailing; a flattering fit-and-flare silhouette; and a vibrant fuchsia color. Isn't it a dream? I'm completely smitten with it. I'm also impressed with the quality and fit. It's soft, drapey, and forgiving with a nice, interior lining to prevent any sheerness when the light hits it. Sometimes I find these styles of dresses to be flimsy and see-through. Not this one, though; it has a nice, medium weight to it and feels extremely well-made. Another bonus is that it's fairly wrinkle-resistant and machine-washable -- yay for no excessive steaming or dry-cleaning expenses! If you're petite like me (I'm 5'2", 100 lbs, and measure 34-25-36) the length hits just below the knees. Depending on how the belt is tied, though, the length of the dress can easily be adjusted by tucking in some of the fabric under the belt, as I'm doing here. This is a small trick I've used over the years to adjust the hemlines of certain dresses to give it a different look. Without any tucking of the fabric, the dress has a lovely, modest length, and makes you look long and lean. Yes and yes! Typically, Nordstrom Rack will primarily carry Nordstrom store stock from prior seasons, so I was pleasantly surprised to see this exact dress being offered concurrently on both websites. It just goes to show you that you should always check and compare items from both websites for availability and for the best pricing. In this case, this dress retails for only $56.97 at the Rack vs. $76.80 at Nordstrom -- nearly a $20 difference! Statement dresses like this one really do all the work for you. With all of its special details, you really don't need much in the way of additional styling or accessories. For this dinner look, I added my favorite pair of gingham pumps. I love gingham-print anything this time of year, and also love the way pink pairs with navy, so this combo was a no-brainer for me. Also, since I can't get enough of it, I took my beige Chanel flap out for a spin. It's my ideal, elegant, neutral bag, and it serves as a nice juxtaposition to the vibrancy of the dress and the whimsy of the pumps. Any neutral bag will work well with this look, and as I've said before, I'm not suggesting that a Chanel or other designer bag is required to create this look. Designer bags are indeed an investment, but I am also an advocate for affordable options that are equally stylish. This bag here, for example, is a great dupe for less, and would look lovely with this dress. I hope you love this "flirty fuchsia" look as much as I do! As always, thanks so much for stopping by and I hope your day is a beautiful and stylish one! Revlon® Ultra HD Matte Lipcolor in "HD Spark"